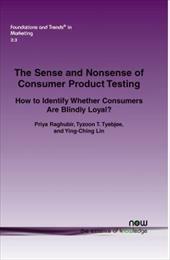 The Sense and Nonsense of Consumer Product Testing reviews the classic issue of product taste testing based on recent advancements made in psychology, neuroscience, and marketing, on how sensory cues affect product judgments. The authors: examine the implications that the five different sensory modalities (the olfactory, auditory, tactile, gustatory and visual systems) interact with each other, rather than exert independent influences, to define a customer’s experience; propose that since consumers are unaware of the influence of a range of stimuli on their judgments and experience, they cannot explicate them, creating methodological challenges for managers to collect valid and reliable consumer insights regarding the consumers’ experience; propose that the methodological paradigm of taste testing can be used to examine the effect of strategic and tactical marketing mix decisions. The goal of this monograph is to use the taste-test as a paradigm to understand how consumers make a range of sensory decisions combining intrinsic product information with the information available in the environment – specifically the research testing context. The Sense and Nonsense of Consumer Product Testing yields reliable insights for managers that would be elusive using standard survey techniques, and adds to the nascent, but growing, literature in marketing on how sensory product experience is multi-modal.